Dear A’s been with us for almost 2 years now. We’ve celebrated 2 Christmases and 1 birthday with another birthday coming up soon. For each occasion, I try to get her something special. My list of a few Do s and a Don’t is below. "Should employers pay for a trip home every couple of years or not?" I thought this was a great question because I'm sure, like me, many of you struggle with how to handle bonuses. Before Dear A won a zillion Air MilesTM I toyed with the idea of paying for a trip home, rather than a cash bonus. I ended up going with the bonus simply because flights were so expensive it was out of the question for our budget. But, I'd like you to share your thoughts, so on to the next poll! 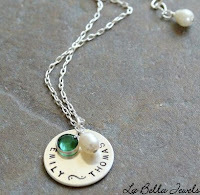 Personalized pendant - These are all the rage for Mom’s. We got Dear A a pendant with her name & K’s, from this site. Webcam, Digital Camera, Laptop – Depending on your budget, anyway to help your nanny stay connected with friends and family back home is great. Gift Certificates – For restaurants, movies, the mall. If your nanny is anything like Dear A, weekends are spent socializing with other nannies. Gift certificates that can cover part or all of their costs are appreciated. I don’t think I need to be explicit, but don’t get your nanny childcare related items. Its like getting a vacuum cleaner as an anniversary present.